CONTI, GREG and WELCH, CHERYL 2015. THE RECEPTIONS OF ELIE HALEVY’S LA FORMATION DU RADICALISME PHILOSOPHIQUE IN ENGLAND AND FRANCE. Modern Intellectual History, Vol. 12, Issue. 01, p. 197. Otter, Sandra Den 2001. Rewriting the Utilitarian Market: Colonial Law and Custom in mid-Nineteenth-Century British India. The European Legacy, Vol. 6, Issue. 2, p. 177. 1 Stokes, Eric, The English Utilitarians and India (Oxford, 1959), p. vii. 2 Stephen, Leslie, The English Utilitarians (3 vols. London, 1900), 1, 169; Mill, J. S., ‘Bentham’, in Essays on ethics, religion and society, Collected works (Toronto, 1969), x, 79; Neal, John, Principles of legislation from the Mss. of Jeremy Bentham (Boston, 1830), preface p. 14; Bowring, John, Memoirs of Bentham, in The works of Bentham (11 vols. Edinburgh, 1838–1843), x, 439 (Works of Bentham hereafter cited as Bowring). 3 See Dicey, A. V., Lectures on the relation between law and public opinion in England during the nineteenth-century (London, 1905); MacDonagh, O., ‘The nineteenth-century revolution in government, Historical Journal, 1 (1958), 52–67; Roberts, D., ‘Jeremy Bentham and the Victorian administrative state’, Victorian Studies, II (1959), 193–210; for a further survey and bibliography of the debate see Taylor, A. J., Laissez-faire and state intervention in nineteenth-century Britain (London, 1972). 5 The projected contents of the new Collected works of Jeremy Bentham are set out in the general preface to Bentham, , An introduction to the principles of morals and legislation, eds. Burns, J. H. and Hart, H. L. A. (London, 1970). Reports on the progress of the edition and notices of other current work in the field are supplied in The Bentham Newsletter (London, 1978–), published by the Bentham Committee. 6 See Burns, J. H., ‘The Bentham project’, Baird, J. D. (ed. ), Editing texts of the Romantic period (Toronto, 1972), pp. 73–87 and ’Dreams and destinations: Jeremy Bentham in 1828’, The Bentham Newsletter, I (1978), 21–30 (to which my remarks here are much indebted); Halévy, Elie, The growth of philosophic radicalism (1st edn, 3 vols. Paris, 1901–1904; trans. Mary Morris, London, 1972 edn). 7 Bentham memoirs, Bowring, x, 27; Burns, , ‘Dreams and destinations’, p. 25. 8 See Burns, , ‘Bentham project’, pp. 77–8 and ‘Dreams and destinations’, pp. 21–2; The correspondence of Jeremy Bentham, vol. 4, ed. Milne, A. Taylor (London, 1981), p. 244. 9 Bentham memoirs, Bowring, x, 566. 10 Sarah Austin in 1861, cited in Ross, Janet, Three generations of Englishwomen (2 vols. London, 1888), 11, 113; Francis Place in 1840, cited in Wallas, Graham, The life of Francis Place (London, 1951 edn), p. 84n. 11 (William Empson),‘Jeremy Bentham’, Edinburgh Review, LXXXVIII (1843), 516. 12 Wallas, Graham, ‘Jeremy Bentham’, in his Men and ideas (London, 1940), p. 19. 13 Hart's, H. L. A. articles are collected in his Essays on Bentham (Oxford, 1982). For Burns, J. H., in addition to the essays cited above (n. 6), see: Jeremy Bentham and University College (London, 1962) ; ‘Bentham and the French Revolution’, Transactions of the Royal Historical Society, ser. 5, XVI (1966), 95–114; The fabric of felicity: the legislator and the human condition (London, 1967); ‘Bentham on sovereignty: an exploration’, Northern Ireland Legal Quarterly, XXIV (1973), 135–50; ‘Bentham's critique of political fallacies’, Parekh, B. C. (ed. 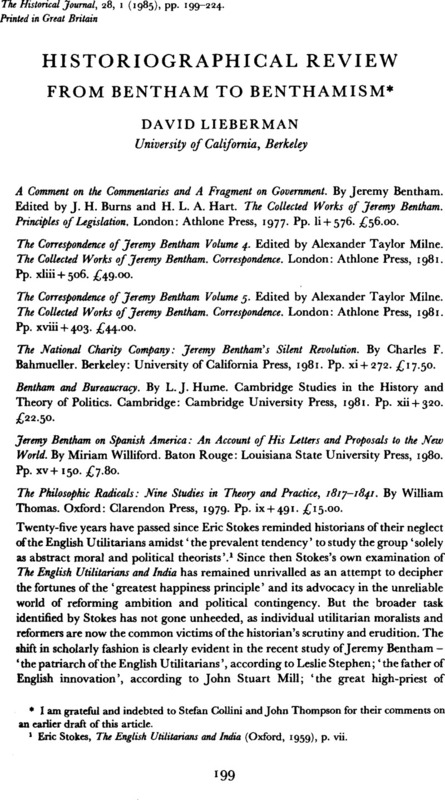 ), Jeremy Bentham: ten critical essays (London, 1974), pp. 154–67. 14 Bentham manuscripts, University College London, Box XXVII, fo. 140 (hereafter cited as U.C. XXVII. 140). 15 Long, Douglas G., Bentham on liberty (Toronto, 1977), pp. xi–xiv, 65–83. 16 Pollock, Frederick, An introduction to the history of the science of politics (London, 1890), p. 96. 17 Dicey, A. V., ‘Blackstone's Commentaries’, Cambridge Law Journal, IV (1932), 290–1..
18 (Jeffrey, Francis), ‘Bentham, Principles de législation, par Dumont’ Edinburgh Review, IV (1804), 17. 19 Blackstone, William, Commentaries on the laws of England (4 vols. London, 1826 edn), III, 265–6. 20 Bentham, , Of laws in general, ed. Hart, H. L. A. (London, 1970), pp. 233, 246. 21 Bentham, , Morals and legislation, p. 305. 22 Ibid. pp. 6, 7. 23 Everett, Charles W., The education of Jeremy Bentham (New York, 1931), p. 196. 25 Bentham memoirs, Bowring, XI, 33. 26 The correspondence of Jeremy Bentham, vol. 3, ed. Christie, Ian R. (London, 1971), p. 618. 27 The correspondence of Jeremy Bentham, vol. 2 ed. Sprigge, Timothy L. S. (London, 1968), p. 188. 29 Bentham correspondence, III, 545. 30 Bentham, , Panopticon: or, the inspection-house (1st edn 1791); Bowring, IV, 40. 31 For a discussion of this material see Burns, ‘Bentham and French Revolution’, and James, M. H., ‘Bentham's political writings, 1788–95’, The Bentham Newsletter, IV (1980), 22–4. 32 See Burns, , ‘Bentham and French Revolution’, pp. 110–14. 33 Bentham memoirs, Bowring, X, 250. For a full narrative of the panoptican venture see Hume, L. J., ‘Bentham's panopticon: an administrative history’, Historical Studies (University of Melbourne), XV (1973), 703–21and XVI (1974), 36–54. 34 So termed by Wallas, Graham, ‘Bentham’, p. 27. 35 For the elderly Bentham's, account see Bowring, XI, 96–107; for the correctives see Hume, , ‘Panopticon’, pp. 39–40, 50–4; Dinwiddy, J. R., ‘Bentham's transition to political radicalism’, Journal of the History of Ideas, XXXVI (1975), 683–700; and Steintrager, James, Bentham (London, 1977). pp. 44–61. 36 Stephen, , English Utilitarians, 1, 205. 37 Bentham, , Morals and legislation, pp. 5–7. 38 Bentham memoirs, Bowring, X, 324. 40 See Memoirs of the life of Sir Samuel Romilly (3 vols., London, 1840), 11, 75–6, and Bentham, , Theory of legislation, ed. Ogden, C. K. (London, 1931), pp. xliv–l. 41 Neal, , Legislation, p. 64. 42 See Halévy, , Philosophic radicalism, pp. 153–4; Bentham's economic writings, ed. Stark, Werner (3 vols., London, 1952–1954), 111, 47–8. 43 Poynter, J. R., Society and pauperism: English ideas on poor relief, 1795–1834 (London, 1963), pp. 139–40. 44 Bentham, , Tracts on poor laws and pauper management (1st edn 1797), Bowring, VIII, 367. 45 Mack, Mary P., Jeremy Bentham: an odyssey of ideas, 1748–1792 (London, 1962), p. 213. 46 Bentham, , Pauper management, Bowring, VIII, 391. 48 Bentham's, classic denunciation of natural rights theory is his Anarchical fallacies (composed 1795–1796), Bowring, 11, 489–534 . For less polemical statements, see Of laws in general, pp. 54–8; Principles of the civil code, Bowring, 1, 302–3. 49 Bentham, , Panopticon, Bowring, IV, 64. 50 Bentham, , Pauper management, Bowring, VIII, 398. 51 Ibid, VIII, 436, 439. 52 Bentham, , Civil code, Bowring, 1, 322 and 301 ff. Even in the pauper proposal, Bentham, still maintained that, ‘The Cases in which it is not better for a man to suffer by his own will, than to be saved against his will, are neither many, nor easy to determine’: Bowring, VIII, 417. For a different case also presenting the panopticon as unrepresentative of Bentham's usual legislative planning, see Rosenblum, Nancy L., Bentham's theory of the modem state (Cambridge, Mass., 1978), pp. 9–20. 53 Bentham MSS, U.C. cliva, 84, cited in Himmelfarb, , ‘Bentham's Utopia: The National Charity Company’, Journal of British Studies, X (1970), 94. 54 Paul, George Onesiphorus, cited in Ignatieff, Michael, A just measure of pain: the penitentiary in the industrial revolution (London, 1978), p. 120; and see pp. 114–42, for a suggestive discussion of the disruptive impact of 1790s radicalism on the proponents of social reform in England. 55 Bentham, , Pauper management, Bowring, VIII, 370n, 420–1. For similar instances of Bentham providing a conservative gloss on his contemporary reform proposals, see Supply without burthen (1st edn 1975) and ‘Circulating annuities’ (composed 1800), Bentham's economic writings, 1, 318–22, 328–37 and II, 293–300. 56 Bentham MSS, U.C. cliiia, 123, cited in Himmelfarb, , ‘Bentham's Utopia’, p. 107; and U.C. cliiia, 132, cited by Bahmueller, p. 183. 57 Bentham, , Plan of parliamentary reform (1st printed 1817, republished 1818), Bowring, III, 438–40, 445–5; Radicalism not dangerous (composed 1819–20), Bowring, in, 609. 58 There are also major editorial problems regarding the existing version of the Constitutional code in the Bowring edition; see Rosen, Frederick, ‘The Constitutional code: the new version’, The Bentham Newsletter, II (1979), 40–3. 59 Stephen, , English Utilitarians, 1, 283. 60 Wallas, , ‘Bentham as political inventor’, Men and ideas, p. 45. 61 See Bentham, , Leading principles ofa constitutional code (1st edn 1823), Bowring, II, 271–2 and ‘Pannomial fragments’, Bowring, in, 211. 62 For a valuable account of these aspects of Bentham's democratic constitutionalism, see Rosen, Frederick, ‘Bentham on democratic theory’, The Bentham Newsletter, III (1979), 50–8 , and his Jeremy Bentham and representative democracy (Oxford, 1983). 63 See, as examples, Bentham's, Church-qf-Englandism and its catechism examined (London, 1817–1818); Book of fallacies (1st English edn 1824), Bowring, 11, 375–487; Plan of parliamentary reform; official aptitude maximized expense minimized (1st edn 1830), Bowring, V, 263–386. 64 Bentham memoirs, Bowring, x, 539, 540, 542. 65 Bentham, , Codification proposal, addressed by Jeremy Bentham to all nations professing liberal opinions (1st edn 1822), Bowritig, IV, 535–94. Bentham's 1822 decision to concentrate on the Constitutional code followed the hope that it would be adopted by the liberal governments of Spain and Portugal, a hope he successively transferred to the independence movement in Greece and the Latin American republics. 66 Neal, , Legislation, p. 24. 67 For other recent accounts of Bentham's Spanish American contacts and influence see McKennan, Theodora L., ‘Jeremy Bentham and the Colombian liberators’, The Americas, xxxiv (1976), 460–75; Schwartz, Pedro, ‘Bentham's influence in Spain, Portugal and Latin America’, The Bentham Newsletter, 1 (1978), 34–5; Alamira de Avila-Martel, ‘The influence of Bentham on the teaching of penal law in Chile’ and McKennan, Theodora L., ‘Benthamism in Santander's Colombia’, The Bentham Newsletter, v (1981), 22–8, 29–43. 68 Bentham memoirs, Boivring, x, 433, 439–44, 457. 69 See Avila-Martel, , ‘Bentham in Chile’, pp. 23–5, McKennan, , ‘Colombian liberators’, pp. 468–9, 473and ‘Benthamism in Colombia’, pp. 32–3. 70 Bentham memoirs, Boivring, x, 515. 71 For the relationship between ‘Rid yourselves of Ultramaria’ and the Constitutional code, see Burns, , ‘Bentham project’, p. 75, and Hume, , Bentham and bureaucracy, pp. 191–2. Bentham's other contemporary tracts for Iberia include On the liberty of the press and public instruction (Bowring, 11, 275–97), Three tracts relative to Spanish and Portuguese affairs, and Letters to Count Toreno (Bowring, vIII, 463–86, 487–554). 72 See above n. 3. The political and ideological context of Dicey's history of Benthamism is illuminated by Collini, Stefan in his Liberalism and sociology (Cambridge, 1979), pp. 13–42. 73 See particularly Gash, Norman, Politics in the age of Peel (2nd edn, Hassocks, 1977)and Cannon, John, Parliamentary reform (Cambridge, 1972), pp. 242–63. 74 For an alternative account of the radicals which shows greater regard for their doctrines and resulting practice see Hamburger, Joseph, Intellectuals in politics: John Stuart Mill and the philosophic radicals (New Haven, 1965). 75 Wallas, , Place, p. 84n. 76 Bentham memoirs, Bowring, xi, 40; see also x, 578–81 (Bentham to Ludwig of Bavaria) and xi, 9–12 (to Wellington). 77 Bentham, , ‘A commentary on Mr Humphrey's real property code’ (1st edn 1826), Bowring, v, 389; and see Long, Douglas G., ‘Bentham on property’, Flanagan, T. and Parel, A. (eds. ), Theories of property: Aristotle to the present (Waterloo, Ont., 1979), pp. 230–1. 78 Radicalism not dangerous, Bowring, in, 599–600, 613, 622. 79 Bentham memoirs, Bowring, x, 543. 80 Fragment on government, p. 421; Bentham memoirs, Bowring, x, 582–3. * I am grateful and indebted to Stefan Collini and John Thompson for their comments on an earlier draft of this article.